When you're searching for a garden table, you probably have a set of criteria for what makes good outdoor furniture. Durability. Attractiveness. Weather resistance. We only sell garden furniture that ticks all of those boxes. For this reason, we specialise in cast aluminium patio furniture. Cast aluminium is the optimum material for all weather garden furniture, because it's impervious to rust and rot. Wooden, cast iron and wrought iron are common choices for garden furniture but each of these materials comes with disadvantages. Wood is susceptible to rotting and splitting. To stop these things from happening you have to buy weatherproof paint and apply coats semi regularly. Cast and wrought iron, besides being rather heavy, are prone to rust. Avoiding rust means hauling your heavy iron furniture to some kind of shelter or buying a cover for it. Weatherproof metal paint also exists but this is an extra cost and ruins the nice metal effect that many people buy iron furniture for in the first place. Aluminium can be left outside all year long and will survive easily. No sanding, painting or covering required. Though sturdy, it's also lightweight, so if you want to move it around, doing so is easy. Forget about tedious maintenance tasks and weather worries. 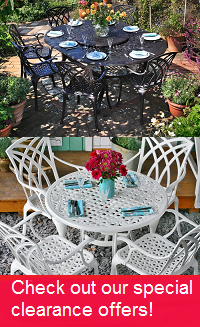 Find a cast aluminium garden table in our range today, and spend more time enjoying your garden. The Claire table is a rectangular coffee table with a superb triangle design on the table top. It functions well as a coffee table and could also be a side table for a barbecue, or placed next to a sun lounger. The Claire table comes in Slate Grey, white, and Antique Bronze. The Sandra table is a more compact option for a coffee table, with a similar design to the Claire table. This square garden table measures 54cm2 and weighs only 6kg. It is available in the same colours as the Claire table. We have the Mia table for those wanting a larger garden table. This round garden bistro table features a diamond lattice design across its 90cm table top. Although it provides plenty of space for lunches, a buffet or drinks, it weighs a mere 10kg. A different kind of bistro table is available in the Alessia bistro table. This chic, simple, steel garden table has a table top diameter of 60cm. It is a folding table, ideal for those who want to make use of the space in their garden when the table isn't needed. It's also a great choice for a balcony. In case you are searching for an extending garden table and chairs, you can head over to our modern garden furniture page. There you'll find black metal garden tables and sleek, glass topped dining tables in a contemporary style. If you came here looking for a full garden furniture set with capacity for a large number of people, go to our 10+ seater garden furniture category. There you have 16 and 14 seater garden tables, including some extending tables, that may better suit your needs. For 2 seater tables that come with chairs included, take a look through our bistro sets page. Delivery is free on all our metal garden tables. So there’s no need to worry about extra charges on the checkout page. Our garden tables are delivered as a large package or on a wooden pallet by our partner couriers Parcelforce or Geodis. Both offer online tracking of your order from the day of dispatch. Geodis will also call you the day before delivery to arrange a time slot that works for you. For details about delivery you can have a look at our delivery information page or give us a call.